Once when I was discussing house decorating with a friend, we decided the only way we could be totally true to our house decorating instincts would be to have at least two separate houses and decorate each to suit our fancy. We could live in one and redecorate the other routinely. This interchange hinged, of course, on every homeowner’s dream of having as much money as needed to get the project done just as you want, and never worrying about cost. Ironically, when people are rich enough to decorate like that they probably don’t do it themselves. They hire decorators. Not me! I talked Hubby into re-doing our main bathroom I’d “put up” with five years, in lieu of four or five days in Hawaii post chemo- and radiation treatments. Hawaii is beautiful but expensive, and while I’d enjoy going back there one more time, I knew I would enjoy a new bathroom 365 days a year even more. I’d never openly pursued the project before because there was nothing intrinsically wrong with the one we had, but it was always in the back of mind. I’m usually frugal about getting rid of something perfectly good just because I don’t like it. Never mind that when we had guests over, I hated sending them to a bathroom that looked as though it had been designed for kids. 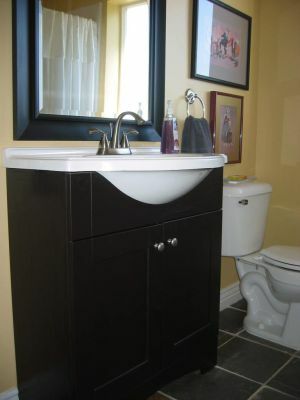 The built-in vanity was about 28 inches high, and even I, at 5’4″ inches, had to bend slightly to wash my hands in the sink. To my surprise, Hubby agreed to have the bath redone and go to Hawaii another time. Maybe. 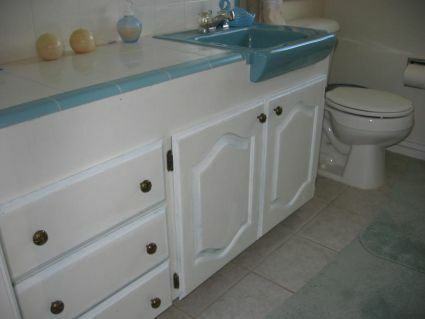 Here’s what the old bathroom vanity looked like. Note the little indented design on the doors. When we moved in they were turquoise too. I painted over them with white, but that turquoise still sang awfully loud. Here’s the new sink and decorator mirror we found The Home Depot. We replaced the old tile above, white with a greenish design sponge-painted look, with a natural looking slate to match the other two bathrooms and foyer areas in the rest of the house. The new vanity is 36 inches tall and I no longer stoop to use it. It’s also only about 18 inches deep compared to the old one at around 24 inches, freeing up the floor for a more spacious feel. I’ve found that anything any deeper just lets things get pushed to the back and forgotten. Everything I need fits right there inside except for towels and they’re in the hall closet right outside. 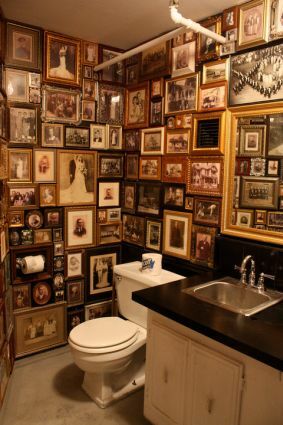 In case you’re interested in my choice of bathroom art, you can click to enlarge the thumbnails below. On the left, which sits above the toilet along with a second print beneath it by the same Tennessee artist called Mänya (Higdon). The artist told me she called it “The Emperor’s Clothes,” and it was caricatures of a few of her friends. The grouping of the three below were salvaged from our storage room because I’ve always loved them and had no place to put them until now. Their whimsical nature helps balance the new more sophisticated look in keeping with the none-sophisticated personality of Hubby and me. The picture at the top is a card stock copy, approximately 6″x7″–the original is much larger, passed out by an art museum in Ohio to promote a painting called “The Shadow.” I had Hubby cut a mat and have found a place for it in every home I’ve lived in since. The middle was a gift, a tie-dyed and painted fabric scene of an African tribe and I’ve always loved it, and the bottom one is a Christmas card sent to us more than 25 years ago from a Japanese colleague of Hubby’s. 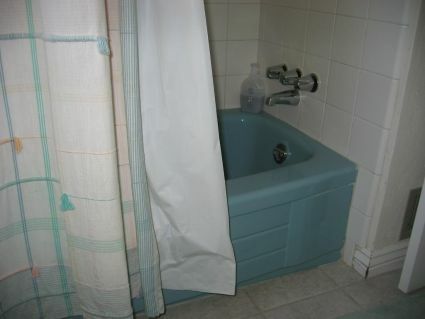 Here’s the old bathtub and bath curtain. Love that turquoise! 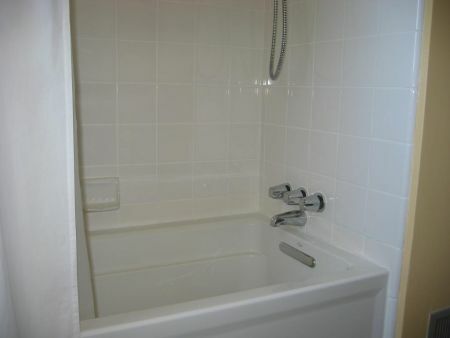 Here’s the new bathtub. Too bad the best parts of the shower curtain is hidden in this picture. It has tiny pin-tucking along the top and bottom of a cotton sheeting material that makes me think of a formal shirt Hubby wore with a tuxedo in a friend’s wedding. (Pin-tucking for those unfamiliar with sewing terms means narrow rows of fabric sown with tiny pleats for a decorative raised look.) The soaking style bathtub is not only deeper than the old turquoise one, but the back is slightly slanted making it more comfortable to lean on for a long bubble sud soak. Yellow is such a difficult color to choose for walls because it’s so easy to get it too pastel or too dark. I knew I wanted yellow but which yellow? As soon as I saw the paint chip sample in the store, I knew it was the one for my new bathroom. It’s called Butterfly Wings, and it too came from Home Depot. By the way, did you know you can buy any color paint in any store that sells paint? I bought the gallon of accent color for my bedroom in one store that happens to be a favorite of many decorators. The paint experts there make me think of those pretentious waiters in some French restaurants I’ve been in. Their prices reflect this. That one gallon of accent paint cost just under $50! If only I’d known, I could have gotten the same color in Home Depot or a less expensive paint store for about $26. They can match any color available anywhere. I think my new bathroom is definitely better–certainly bigger–than before. I’m very happy we decided at last to have it redone. Now, you kn ow that second house I spoke of in the opening? Well, this picture turned up on someone’s Facebook page last week. I’d give a link except that I don’t remember where I found it, but copied the picture for my file of home ideas for future decorating projects. If only I’d seen it before and not after the new bathroom was finished! A second house, however, would have more bathrooms to redecorate. Not that it’s likely I’ll have to worry about it anytime soon, I’ve already decided on the new look I want in the next bathroom I decide to redo! What do you think? I’d probably want to sit there all day. I love it!!! And my bathroom needs redone but I rent and I doubt my landlord would pay for it. Oh well. Yes three, I did that to the downstairs bath when we first moved in. Hanging the family solved two problems. Sorry, Sue, it took me so long to get back in here to respond to your comment. Did you mean the yellow walls in Connecticut? I met you in Pittsburgh, but I don’t remember ever seeing you in Columbus. I loved that Connecticut yellow myself, but it took me forever to approximate the same color here. Everything kept coming up too light or sunny or the opposite–too dark. You have a good memory for color!